However, the DeLines, from St. Louis, Missouri, didn’t feel like they were doing anything extraordinary. “He was our child, and we did what we should have done,” Ann says. Ann and Mark were high school sweethearts; they met and fell in love their senior year of high school, and they married in their early 20s. Both from large Catholic families, they went on to have six healthy children. With their eldest son preparing for college and their youngest daughter going into second grade, Ann and Mark were entering a new phase in their life. They assumed they were done having children, so when Ann, 45, discovered on March 25, 2015 that she was pregnant again, the DeLines were in shock. For Ann, that shock was mingled with a gut feeling that something was wrong with their preborn baby boy, so she had some blood work done. Trisomy 18, also referred to as Edwards’ syndrome, is a chromosomal disorder where the developing baby receives an extra chromosome 18, which can affect the heart and other major organs. Infants with Trisomy 18 are typically female; have a low birth-weight; a small, strawberry-shaped head; a small jaw and mouth; and deformities in feet and hands. The prognosis is bleak for babies with this diagnosis; only five to ten percent live past the first year after birth and most have an intellectual disability. When Mark called Ann’s doctor, the doctor—who’s also a Catholic— went over the scenarios of possible outcomes for their son. He told Mark, “‘I think that you know one of the options, but I am not even going to go down the road with you guys.” The doctor knew that the DeLines were not going to abort. Mark and Ann were upfront with their six children, telling them that their baby brother probably wouldn’t make it. “They all cried. I told them, ‘God picked our family for a reason, and we will get through it together as a family,’” Ann recalls. Even though the prognosis was grim, they didn’t lose hope. Everyone in the family prayed for a miracle, “especially our 10-year-old daughter, Clare, who prayed every night,” Mark says. However, the ultrasound tech, with great compassion, showed them that John Paul was missing his cerebellum, had clubfoot, Trisomy hands, and the typical strawberry-shaped head. Mark and Ann felt God was watching over their children since they have no fearful memories. 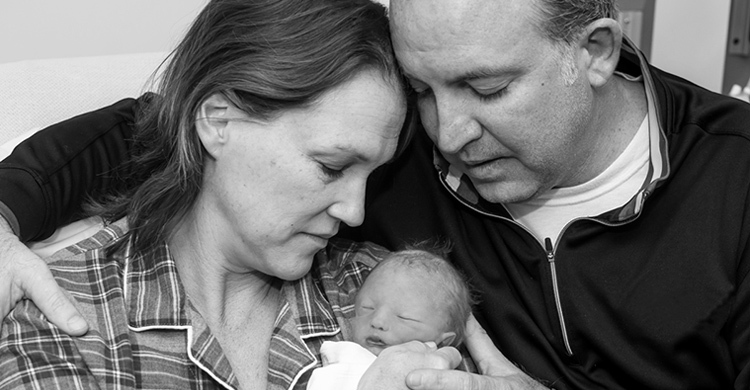 “Throughout the whole pregnancy, we kept saying, ‘We hope that he will be born alive so that we can hold him.’ God knew better than we did,” Ann says. Their priest, Fr. Richard Stoltz, had been waiting with the children outside Ann’s room when the nurse informed him and the family that John Paul had not made it. When he entered the room, he saw a sight that touched him deeply. “There he was—in his little knitted cap—so peaceful and beautiful, held by Ann,” Fr. 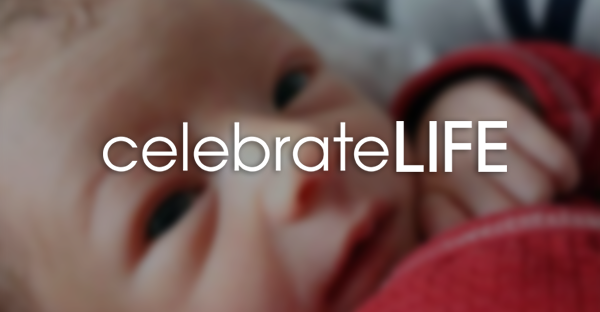 Stoltz told Celebrate Life. The story of John Paul the Small is a beautiful witness to the value of every human being’s life and to the truth that it is not for us to decide who lives and who dies for any reason, including adverse prenatal diagnoses.